Globalization is a metaphor for the increasing interconnectedness of the world. It refers to a broad spectrum of processes in the contemporary world, including large-scale international migrations, the rapid growth and impact of modern information and communication technologies, the unprecedented flow and movement of capital, technology, goods and services, peoples, ideas, lifestyles and cultural symbols, the global intertwining of communication, production and consumption, the rise of supranational frames of power and international relations, the increasing porousness and fluidity of national borders, and transnational diasporas. Under the impact of globalization, all countries are now increasingly interconnected through trade, information and communication technologies and migration, and social, economic and political processes are becoming increasingly global in scope. Globalization is a complex, multi-layered process, involving economic, technological, social, political and cultural dimensions, which are often interlinked. The use of modern information and communication technologies, especially mobile phones, smartphones, the Internet and social networking sites is rapidly increasing across large parts of the Muslim world. The following chart shows the penetration of smartphones in selected Muslim countries. Although access to modern information technologies in the Arab region is lower than the world average, there has been significant progress in recent years. Arab youth are generally connected to electronic and digital means of information and social media have become a major part of their daily lives. According to Arab Human Development Report 2016, mobile phone use has surged from 26 per cent in 2005 – then below the world average – to almost 108 per cent in 2015 – higher than the world average. Similarly, internet use jumped from 8 per cent (5 million) in 2005 to 37 per cent (141 million) in 2015 – higher than the global average and highest among developing countries. The Middle East is on the threshold of a digital transformation. According to the McKinsey Middle East Digitization Index, the cross-border data flow connecting the Middle East to the rest of the world has increased by more than 150-fold. The UAE, Bahrain and Qatar have the world’s highest smartphone adoption rates and social media use, higher than those in the United States. In the past few years the Internet has emerged as an important source of information on Islam and Muslims. The entire text of the Quran, including recitation and translations and commentaries into English, French and other languages, several collections of Hadith and Islamic law and legal edicts (fatawa) are now available online. An important aspect of the digitization of Islam is the preparation of CD-ROM discs containing 7,500 Hadith from the seven authoritative collections of Hadith, with translations of selected texts in ten languages. In 2000, more than 14,000 fatwas could be found on the Internet. The US-based IslamiCity has published more than 5000 fatwas on the Internet. A-Sunna Foundation of America runs a website http:///www.sunnah.org/fatwa on the subject. One can get a fatwa online from efatwa.com, askimam.com and other sites. Online fatwas are available in English, Arabic, Persian, Turkish, Malay, Urdu and Thai languages. Cairo’s famed Al-Azhar University runs an “Islamic Hotline,” where users can call or email a question, which is answered within 48 hours. Shaykh Yusuf al-Qaradawi hosts a hugely popular Arabic programme Al-Shariah wal-hayat (Shariah and Life) on Al-Jazeera television, which is watched by tens of millions of viewers across the Arab world. He also runs a website called IslamOnline, which he founded in 1997, where he offers his opinions and fatawa on a variety of issues. Dr. Al-Qaradawi has 269,741 followers on Facebook. The lectures and discourses of some Muslim scholars are uploaded on YouTube. The speeches and sermons of Amr Khaled, an Egyptian preacher, on television are watched by millions of people of Arab origin in the Middle East, North Africa, Europe and North America. The videos of Hamza Yusuf, a popular California-based Islamic preacher, are watched by hundreds of thousands of Muslims around the world. Interestingly, many spiritual guides and healers (marabout) in Mauritania and other African countries now use Skype to communicate with their followers. A significant aspect of the digitization of Islam is the increasing use of digital technology, particularly smartphone apps, for Islamic requirements such as finding the direction of the qibla, reading the text of the Quran or listening to its recitation, times for prayer and fasting, proximity to a mosque and accessibility of halal food. 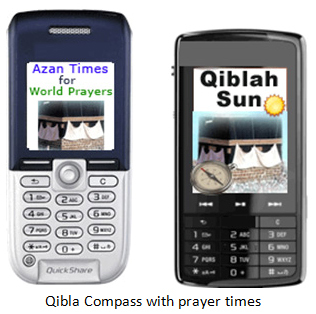 There are Android apps on Google Play for finding the direction of the qibla. 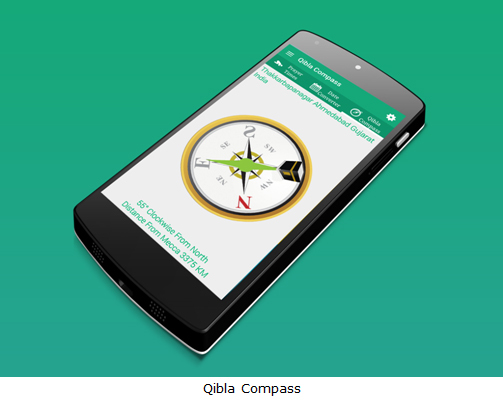 Qibla Compass is an app that indicates the direction of the qibla from anywhere in the world. One can enter one’s location in the app and get the precise direction of the qibla using the online Qibla Compass and Google maps. Salah 3D is an iPhone app designed to guide how one should offer prayers. 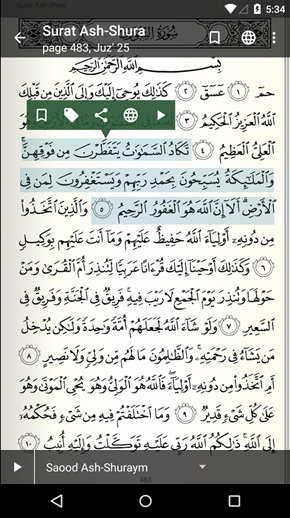 Another app called Quran Majeed includes the text and audio versions of the Quran. The app has been downloaded more than three million times. 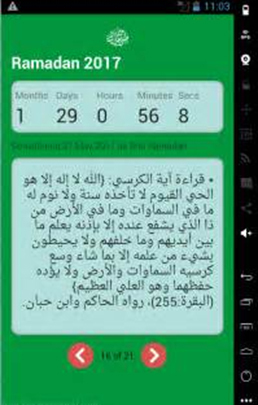 Another smartphone app called Ramadan Times announces the time to commence and break the fast during the holy month. 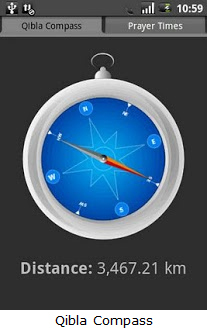 The app, created by a Pakistani company, sets the time for the beginning of the fast and for breaking it according to the location of the device. 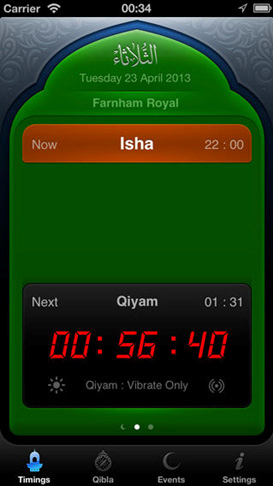 Apps like iPray offer a beeping reminder of prayer times and also indicate the direction of the qibla from anywhere in the world. A number of Islamic apps for Android mobile and tablet PC are available, including QuranAndroid and Al-Quran, which contain recitation of the Quran as well as an English translation. Apps like iQuran (iOs and Android) and Quran Reciter are now used by an increasing number of Muslims, particularly in Western countries, for reading the text of the Quran and for listening to its recitation by reputed qaris. Al-Khwarizmi is a major company for the development and marketing of Islamic apps. Ramadan 2017 Android Apps on Google Play contain a number of features, including 2017 Ramadan calendar, prayer times, qibla compass, sehri and iftar times with alarm, azan, 99 names of Allah, Islamic Hijri calendar, Hijri date converter and Ramadan Duas. The Ramadan Daily Dua app, available for iPhone and iPad, provides special prayers for Ramadan. Nokia has brought out an updated Ramadan application suite, which allows users to read the Quran and provides information about prayer times as well the location of the nearest mosque. Google has a hub for Ramadan. At the end of the fasting month, users can send Eid al-Fitr greetings via another app. The German television channel RTL2 flashes up a message at the time of suhur and iftar. Digital technology is also being used for the calculation of zakat one is required to pay and for soliciting zakat and donations by charitable organisations. 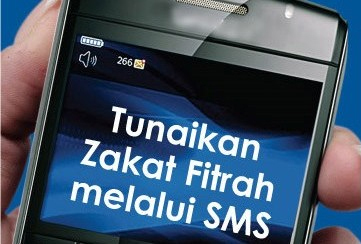 E-zakat or electronic zakat is one of the channels to pay zakat online, which can be done through smartphones or tablet. E-zakat payment services enable users to pay zakat from their bank accounts, debit or credit cards and even sms. The portal http://www.zakat.com.my helps Muslims pay zakat online at their own convenience at home or office from anywhere in the world. 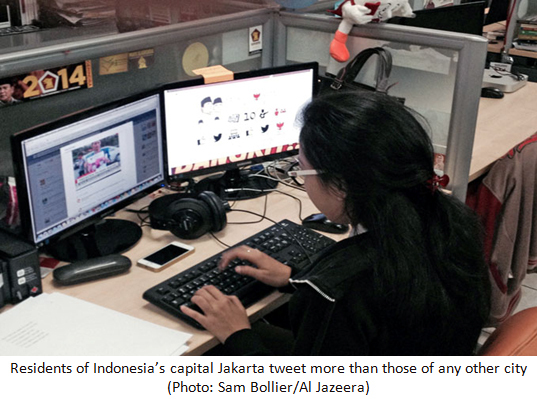 Several Islamic banks in Muslim countries offer online zakat payment services. In Malaysia, for example, Bank Islam provides an online zakat payment service. Muslims in Malaysia can make their zakat payments online by visiting the PPZ-MAIWP portal. Bank Muscat was Oman’s first commercial bank to launch an independent Islamic banking window operations. Meethaq Islamic Banking, an arm of Bank Muscat, offers a range of Shariah-compliant products and services, including home finance, car finance and savings accounts. 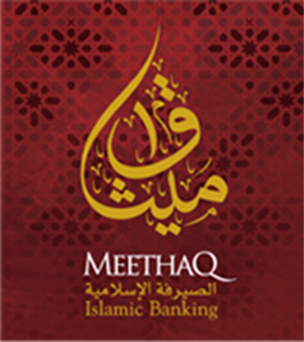 In 2013 Meethaq launched a service to make zakat, sadaqat and waqf payments through a mobile app called “Meethaq Cloud.” The app, launched in association with Oman’s Ministry of Awqaf and Islamic Affairs, has a wide range of distinctive features. It is quick and easy to download and provides customers with a secure and convenient all-time access to their accounts. Cloud banking eliminates the requirement to visit the branch for various banking transactions. Meethaq Cloud is equipped with some additional features, including a Masjid locator to identify the nearest mosque, qibla compass to check the direction of the qibla and prayer and fasting times. The app also includes features such as a zakat calculator to determine the amount of zakat one is obliged to pay, which can be directly transferred to the Ministry of Awqaf. 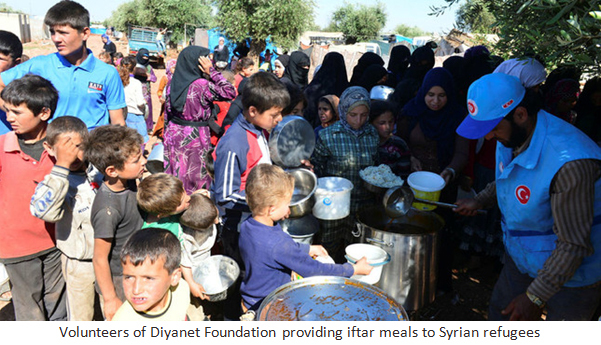 Voluntary organisations in many Muslim countries provide iftar meals to poor people and refugees. Turkey’s Iyilikder Charity provides iftae meals to thousands of poor Muslims in 15 countries, including Bosnia-Herzegovina, Syria, Kyrgyzstan, Niger and Palestine. In Turkey, volunteers of Diyanet Foundation (TDV) provided iftar meals on the first day of Ramadan this year to 1,50,000 Syrian refugees living in camps in the northern Syrian province of Idlib and in Palestine’s Gaza. Voluntary organisations coordinate their activities largely through mobile phones, Twitter, WhatsApp and other digital media. Voluntary groups and local organisations arrange a collective iftar at public squares in many cities in the Muslim world. 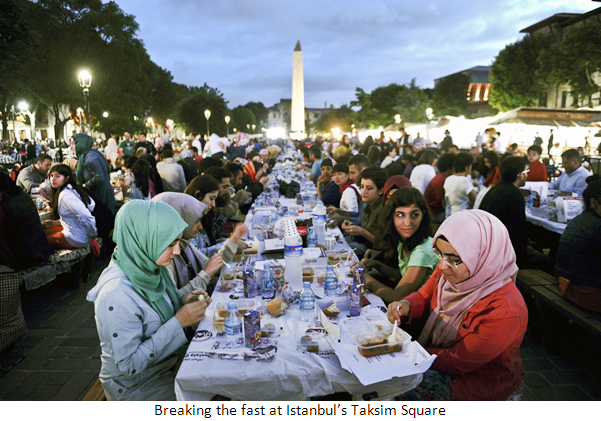 The annual iftar meal organized at Istanbul’s Taksim Square is attended by thousands of men and women. The event is coordinated by volunteers through mobile phones, Twitter and WhatsApp. In most parts of the Muslim world, the duration of fasting days in Ramadan is generally between 14 and 16 hours. However, in the Northern Hemisphere (above 48 degrees latitude) days are extremely long in summer and nights extremely short in winter. Iceland, Norway, Finland, Sweden, Denmark, Alaska (USA), St Petersburg (Russian Federation) and northern Canada experience extreme variations in the length of days and nights in summer and winter. Regions to the north of the Arctic Circle experience what is known as the ‘midnight sun’ in summer. From June 12 to July 1 the sun stays up around the clock and does not set. In some parts of Norway and Sweden the sun never goes down for nearly two months in summer and there is broad daylight around the clock. In winter the Northern Hemisphere experiences what is known as ‘polar nights.’ From November 25 to January 21 the sun does not rise above the horizon. In Norway’s capital Oslo, for example, nights are extremely long in winter, lasting for 16 hours while days are short, lasting for 8 or 9 hours. The extremely long days in summer and long nights in winter in the Arctic Circle raise questions about the timings of prayer and fasting. The historian Masudi (d. 345 AH) and the astronomer Albiruni (d. 440 AH) have mentioned that days and nights in the regions located near the poles are unusually long. An eminent Turkish scholar Haji Khalifa (d. 1658 CE) raised the question about determining the timings of prayers and fasting in the regions near the poles. The question of determining the timings of prayer and fasting in the Northern Hemisphere is no longer a hypothetical one. Since the early 1980s, thousands of Muslims, mainly immigrants, refugees and asylum seekers, have settled in northern Europe. Kiruna, the northernmost part of Sweden located 145 km north of the Arctic Circle, is home to approximately 700 Muslims. Over 1,000 Muslims are living in Tromso in Norway, 350 km north of the Arctic Circle. The population of Muslims in Iceland exceeds 1,200. More than 42,000 Muslims are living in St Petersburg. Finland has a Muslim population of approximately 60,000. In the Quran and Hadith, the timings of prayer and fasting are stipulated on the basis of such natural signs as dawn, sunrise, sunset and the disappearance of twilight. Since these signs are markedly different in the Northern Hemisphere in summer and winter, Muslims living in the region are faced with a dilemma. In Makkah, for example, the variations in the duration of fasting days throughout the year are within 2 hours and 44 minutes. In Oslo, there is a variation of 12 hours in the length of days in summer and winter. In Lulea, a city in the north of Sweden, the dawn time in June is 00:51 a. m. and the sunset time is 11:43 p. m. If one observes the fast according to local timings, the fasting day will last for 21 to 23 hours, leaving just about one or two hours for breaking the fast, suhur for the following day and maghrib, isha and tarawih prayers. Muslims living in the Northern Hemisphere follow different patterns and time schedules for beginning and breaking the fast. In Kiruna, Sweden, the majority of Muslims follow the timings of the Swedish capital Stockholm, 1,240 km further south, where there are days and nights in summer, unlike in Kiruna, and where fasting days in summer last for about 20 hours. This is according to the advice given by the European Council of Fatwa and Research (ECFR). 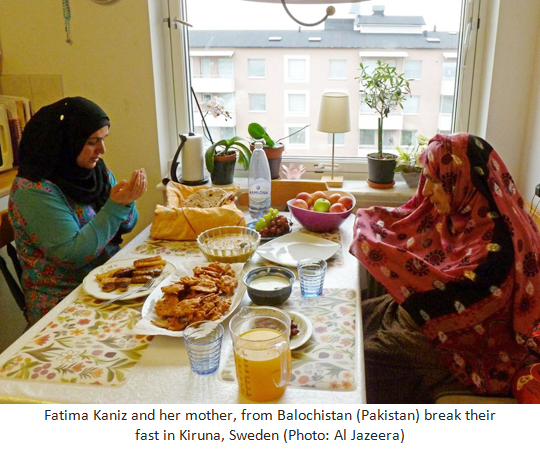 Some of them follow the timings of Makkah and Madinah for beginning and breaking the fast while others follow the timetable of Istanbul, the closet Muslim city from Kiruna. A few of them follow the local timings. In Tromso, Norway, Muslims generally follow the timings of Makkah and Madinah for prayer and fasting. There is a good deal of confusion, contestation and uncertainty about fasting times in many parts of northern Europe, mainly due to an absence of consensus among scholars and jurists about prayer and fasting timings in the Northern Hemisphere. Broadly, one can identify three distinct legal opinions or fatwas in respect of prayer and fasting timings in those regions of the Northern Hemisphere which have extremely long days in summer and long nights in winter. One of the earliest views on the subject was expressed by Muhammad Abduh. He argued that the timings for prayer and fasting, which are stipulated in the Quran and the Prophet’s Sunnah and which are based on such natural phenomena as dawn, sunrise, sunset and the disappearance of twilight, are applicable to regions that have normal or moderate days and nights. He suggested that in the Northern Hemisphere, where days are extremely long in summer and nights extremely long in winter, the timings for prayer and fasting should be estimated or calculated in accordance with the timings of those regions which have normal or moderate days and nights. There is some difference of opinion among Muslim scholars and jurists about the lands which have normal days and nights and which could be used as a yardstick for the estimation of timings for prayer and fasting in the Northern Sphere. 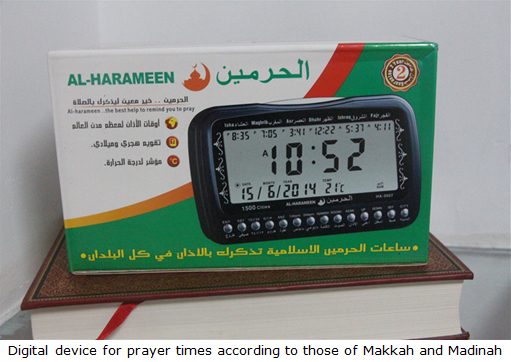 Some jurists have suggested that the timings for prayer and fasting in Makkah and Madinah should be followed in the Northern Sphere. Others are of the view that the timings of the nearest regions with normal or moderate days and nights should be adopted for the purpose. Muhammad Abduh held that both opinions are valid and legitimate. Abduh’s views have been endorsed by Dar al-Ifta al-Misriyyah as well as several eminent Muslim scholars, including Shaykh Mustafa al-Zarqa, Mahmud Shaltut, former Grand Imam of Al-Azhar Mosque, Dr Muhammad Sayyid Tantawi, former Grand Mufti of Egypt, Dr Ali Juma’a, former Grand Mufti of Egypt, Shaykh Jadd al-Haqq, former Grand Imam of Al-Azhar and Shaykh Muhammad Abu Hashim, former Grand Mufti of Jordan. In 1930 a committee comprising some ulama and scientists was constituted in the erstwhile Hyderabad state in the Indian subcontinent for the purpose of offering suggestions, in the light of Islamic law as well as scientific observations, about the determination of the timings of prayers and fasting in the regions near the poles. After much deliberation the committee suggested that the world’s regions should be classified into normal and abnormal zones, and that this classification should be based on the length of days. The two zones should be divided by drawing a line at 45 degrees latitude. The normal zone would comprise the regions that lie at 45 degrees latitude, and the timings for prayers and fasting that prevail in the normal zone should be made applicable to the regions that lie in the abnormal zone above or below 45 degrees latitude. In other words, the timings for prayers and fasting in the abnormal zone should be determined not according to the movement of the sun but the movement of the clock. The timings for prayer and fasting in Paris, for example, would be applicable to Sweden and Norway. This suggestion was later approved by the ulama of Makkah, Madinah and Cairo. A conference of Muslims jurists and astronomers was held in Istanbul about three or four decades ago. All the jurists gathered there agreed that the areas above 64 degrees latitude in the north and below 64 degrees latitude in the south should be considered 'abnormal zones' wherein people should not follow the movement of the sun but the movement of the clock for their daily prayers and fasting. They can pray and fast according to the timings of the cities that are nearest to them in the normal time zone, i.e. below 64 degrees north or above 64 degrees south. Professor Muhammad Hamidullah (1908-2002), a renowned Islamic scholar, proposed that regions that are above 45 degrees latitude in the Northern Hemisphere and those below 45 degrees latitude in the Southern Hemisphere should be considered abnormal for the purpose of determining the timings for prayers and fasting and that these regions should follow the timings of normal zones at 45 degrees latitude. He suggested that if one takes the latitude of 45 degrees North or South as the limit of a normal zone, the maximum duration of fasting days in the northern region would be 16 hours and the minimum 8 hours. A third view is espoused by some Saudi scholars and jurists. Shaykh Abd al-Aziz ibn Baz, former Grand Mufti of Saudi Arabia, gave a fatwa to the effect that as long as there are days and nights (regardless of their length within 24 hours), one must fast from dawn to dust. This view has been endorsed by Saudi Arabia’s High Council of Ulama, which has held that one must begin and break the fast according to local timings as long as night is distinguishable from day, regardless of how long the day might be. Many eminent scholars and jurists have pointed out that this fatwa is at variance with the higher purposes and intents of Islamic law (maqasid al-Shariah) and the basic principles of Islamic jurisprudence, which emphasize ease, convenience and facilitation for the Muslim ummah. The Quran says: “Allah desires for you ease and convenience, and not hardship” (2:185). Further: “Allah does not burden a person beyond his capacity” (2:286). The Prophet (SAAW) said: “Make things easy for people; do not make things hard for them. Give them good tidings and do not make them turn away from religion (by making things hard for them).” When fasting days are as long as 20-22 hours (as is the case in many regions of the Northern Hemisphere in summer), it is too inconvenient, if not impossible, to break the fast and partake of suhur for the next day’s fast and offer the maghrib, isha and tarawih prayers in the space of two or three hours. Furthermore, fasting for 21-22 hours over a month has deleterious effects on health. Islamic economy, comprising Islamic finance, the halal food industry, modest Islamic clothing, halal travel, halal media and recreation sector and halal pharmaceutical and cosmetics sector, is growing at twice the rate of global economy. According to a recent study by Thomson Reuters, global Muslim spend on apparel and footwear in 2015 was $244 billion, accounting for 11% of the global market spend. It is expected to grow to $322 billion by 2018 and to $368 billion by 2021. The global Islamic garments, fashion and design market is larger than many top global clothing markets such as Japan, with customer spending worth $111 billion, Russia, with $106 billion and Germany, with $101 billion in 2012. The global Muslim market ranks third behind the US and China and ahead of the UK. Mainstream global fashion brands such as H&M, Dolce and Gabbana, DKNY, Zara, Burberry, Marks and Spencer, Tommy Hilfiger, Mango, Uniqlo and Oscar de la Renta are waking up to the growing vogue of trendy and modest Islamic clothing among Muslim women around the world. 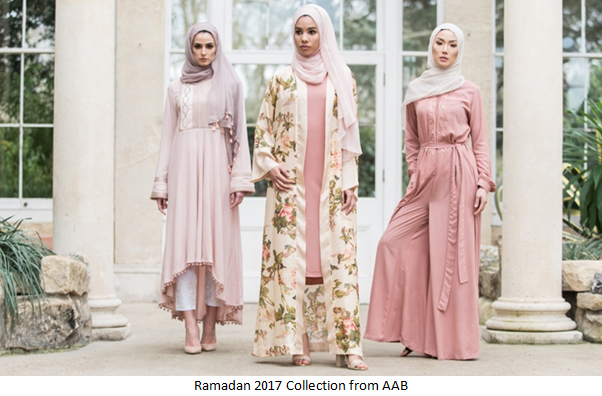 Fashion-conscious Muslim women from affluent families, who are keen to combine fashion with modesty, are driving this market forward. 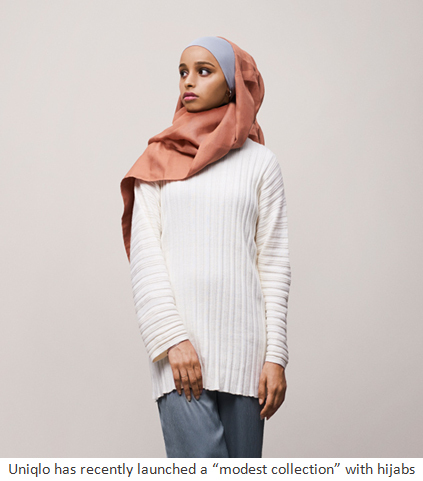 Fortune magazine recently described Muslim women as the next big untapped fashion market. Several leading designers have started producing and showcasing garments especially designed for Muslim women. DKNY launched its Ramadan Collection of trendy and modest garments in 2014 and Tommy Hilfiger launched its Ramadan Collection in June 2015. Zara, Mango, Burberry, Uniqlo and Oscar de la Renta have also brought out their special Ramadan Collections. Instagram is now widely used for sharing pictures of trendy and modest Islamic garments and headscarves.